200 Best Genre Pictures of Everyday Scenes By the World's Best Painters.  What is a Genre Painting?  When was the first Genre Painting produced? What is a Genre Painting? In fine art, a genre painting is the depiction of an everyday scene, in which one or more human figures play a significant part. The scene in question is usually painted in a realistic or at least non-idealized manner. This is the closest we can get to a definition of a genre painting, because there is no firm dividing line between this type of picture and (say) a landscape, or even a portrait. When was the first Genre Painting produced? Small touches of genre are evident in 15th century Italian paintings, such as those of the Venetian painter Vittore Carpaccio (c.1500), but usually such elements were merely background for what was really religious paintings. Besides, realistic genre painting did not fit with the idealization of face and figure favoured by the Italian Renaissance. Not surprisingly, therefore, it was left to the more down-to-earth Northern Renaissance Artists (1430-1580) to pioneer the form, and to the later Dutch Realist artists to perfect it. Here is a selected list of works, listed by artist, covering most major schools and movements. Founder of the Antwerp School of Flemish painting. The Money Lender and His Wife (1514) Louvre Museum, Paris. Netherlandish Proverbs (1559) Staatliche Museen, Berlin. Mad Meg (Dulle Griet) (1562) Mayer van den Bergh Museum, Antwerp. Massacre of the Innocents (c.1565-7) K.M., Vienna. Hunters in the Snow (1565) K.M., Vienna. The Wedding Dance (1566) Detroit Institute of Arts. Parable of the Blind (1568) Museo Nazionale di Capodimonte. Peasant Wedding (1568) K.M., Vienna. Dutch painter noted for his wintry genre paintings. A Scene on the Ice Near a Town (1615) National Gallery, London. The Operation (1631) Alte Pinakothek, Munich. Maidservant at a Window (1640) Museum Boymans-van Beuningen, Rotterdam. The Mousetrap (1645-50) Musee Fabre, Montpelier. Follower of caravaggism, Utrecht School. The Merry Fiddler (1623) Rijksmuseum, Amsterdam. Concert on a Balcony (1624) Louvre, Paris. Courtyard of a House in Delft (1658) National Gallery, London. The Linen Cupboard (1663) Rijksmuseum, Amsterdam. Dutch Realist noted for his deep linear perspective. The Slippers (1654-60) Louvre, Paris. View down the Corridor (1662) Dyrham Park, UK. Carousing Couple (1630) Louvre Museum, Paris. The Rejected Offer (1631) Mauritshuis, The Hague. Dutch genre painter active in Dordrecht. The Eavesdropper (1657) Dordrecht Museum, Dordrecht. Dutch Realist from Leiden noted for polished small-scale genre paintings. The Prodigal Son (1640s) Hermitage Museum, St Petersburg. The Music Lesson (1658) National Gallery, London. Rustic Concert (1638) Prado, Madrid. Interior with Peasants (1663) Wallace Collection, London. Beware of Luxury (1663) Kunsthistorisches Museum, Vienna. The Christening Feast (1664) Wallace Collection, London. Famous for his guardroom scenes and tavern genre paintings. Gambling Scene at an Inn (1649) Wallace Collection, London. Dutch Realist painter noted for moralizing pictures. Parental Admonition (1654-55) Staatliche Museen zu Berlin. Woman Writing a Letter (1655) Mauritshuis, The Hague. Flute Players (1621) Staatliche Kunstsammlungen, Kassel. Leader of the Delft School of Dutch Realism known for his cool interiors. Soldier and a Laughing Girl (c.1658) Frick Collection, New York. The Milkmaid (1658-60) Rijksmuseum, Amsterdam. Little Street (Street in Delft) (1657-8) Rijksmuseum, Amsterdam. Young Woman with a Water Jug/Pitcher (c.1662) Metropolitan Museum, NY. Woman Holding a Balance (1662-3) National Gallery of Art, Washington DC. Woman with a Pearl Necklace (c.1662) SMPK, Gemaldegalerie, Berlin. The Lacemaker (1669-70) Louvre, Paris. For more, see: Dutch Realist Genre Painting (17th century). French Baroque portrait artist and genre painter. The Cheat with the Ace of Diamonds (1647) Louvre Museum, Paris. Best-known as a portraitist but when young he specialized in a type of genre painting (called bodegones), of which this is his masterpiece. The Waterseller of Seville (1618-22) Apsley House, London. French Baroque genre painters and portraitists. Family of Country People (1640) Louvre, Paris. Blacksmith at His Forge (1640) Louvre, Paris. An Afternoon Meal (1739) Louvre, Paris. French Rococo still life and genre painter. Saying Grace (Le Benedicite) (1744) Hermitage, St Petersburg. French Rococo artist, pupil of Francois Boucher. The Swing (Fragonard) (1767) Wallace Collection, London. Young Girl Reading (1776) National Gallery of Art, Washington DC. The Guitarist (1757) National Museum in Warsaw. L'Accordee de Village (1761) Louvre, Paris. English Rococo-era painter noted for his satirical morality genre scenes. The Rake's Progress (8 scenes) (c.1735) Sir John Soane's Museum, London. Marriage a la Mode (6 scenes) (c.1743) National Gallery, London. The Introduction (1740) Louvre, Paris. Leading Scottish painter best-known for his portraiture. Rev Robert Walker Skating on Duddingston Loch (1784) NGS, Edinburgh. Taste (From the Five Senses series) (1715-34) Pushkin Museum, Moscow. The Drawing Lesson (1750) Nelson-Atkins Museum of Art, Kansas City. Rococo portraitist and genre painter. The Oyster Lunch (1735) Musee Conde, Chantilly. An Embarrassing Proposal (1716) Hermitage, St Petersburg. Pilgrimage to Cythera (1717) Louvre, Paris. An Experiment on a Bird in the Air Pump (1768) National Gallery, London. Time Flies (1887) Crawford Municipal Art Gallery, Cork. Realist/Impressionist painter and financial supporter of Monet and others. Bazille's Studio (1870, Musee d'Orsay). Summer (1893) Turku Art Museum, Finland. Ploughing in the Nivernais (1848) Musee d'Orsay, Paris. Colourist painter, co-founder of Les Nabis. The Green Blouse (1919) Metropolitan Museum. The Terrace at Vernon (1939) Metropolitan Museum. Plein air painter of beach scenes. The Beach at Trouville (1864) Musee d'Orsay, Paris. English genre painter and landscape artist of the Newlyn School. Domino! (1886) Crawford Municipal Art Gallery, Cork. The Floor Scrapers (Floor Planers) (1875) Musee d'Orsay, Paris. Paris Street, Rainy Day (1877) Art Institute of Chicago. 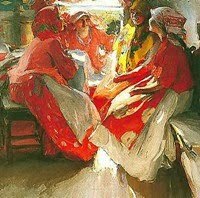 Leading female American Impressionist painter. Young Woman Sewing in the Garden (1886) Musee d'Orsay. French Impressionist and Post-Impressionist painter. Man Smoking a Pipe (1890-2) Hermitage, St Petersburg. Woman with a Coffee Pot (1890-5) Musee d'Orsay. The Card Players (1892-6) Various art museums. The Large Bathers (1894-1906) London and Philadelphia. English painter, member of the Australian Heidelberg School near Melbourne. Going Home (1889) National Gallery of Australia, Canberra. Leader of French realism movement. A Burial at Ornans (1850) Musee d'Orsay, Paris. The Wheat Sifters (1854) Musee des Beaux-Arts, Nantes. The Third Class Carriage (1864) Walters Art Museum, Baltimore. Race Horses in front of the Stands (1866-8) Musee d'Orsay. Women Ironing (1884) Musee d'Orsay. The Gross Clinic (1875) Jefferson University, Pennsylvania. The Agnew Clinic (1889) University of Pennsylvania. The Mayor's Courtship (1848) Tretyakov Gallery, Moscow. English genre painter of large public scenes. Derby Day (1856-8) Tate Gallery, London. Colourful symbolist painter noted for his Tahitian pictures. Cafe in Arles (1888) Pushkin Museum, Moscow. Ruperupe (Gathering Fruits) (1899) Pushkin Museum. The Potato-Eaters (1885) Van Gogh Museum, Amsterdam. Woman at a Table in the "Cafe du Tambourin" (1887) VGM, Amsterdam. All-Night Cafe at Arles (1888) Yale University Art Gallery. Van Gogh's Bedroom in Arles (1888) Musee d'Orsay. The Hospital at Arles (1889) Oskar Reinhart Collection, Winterthur. The Olive Pickers, Saint-Remy (1889) Private Collection. Noon Rest (After Millet). Saint-Remy (1890) Musee d'Orsay. A Hind's Daughter (1883) National Gallery of Scotland. See also: Glasgow School of Painting (c.1880-1915). Danish post-Impressionist famous for his quiet interiors. Interior with a Girl at the Clavier (1901) Private Collection. Leading Impressionist painter in America. Church Procession, Spanish Steps (1883) Private Collection. Boston Common at Twilight (1886) Museum of Fine Arts, Boston. Paris Street Scene (1887) Private Collection. Snap the Whip (1872) Butler Institute of American Art, OH. Irish landscape painter, best-known for his Brittany paintings..
Sunshine, Brittany (1884) Private Collection. Danish painter famous for his tranquil interiors; influenced by Dutch Realists. Danish Post-Impressionist, plein air landscape & genre painter. Lunchtime (1883) Skagens Museum, Denmark. Summer Evening on the Southern Beach (1893) Skagens Museum, Skagen. One of the greatest of Irish artists. The Bridge at Grez (1883) Private Collection. Hotel Chevillon (1883) Private Collection. Under the Cherry Tree (1884) Ulster Museum of Fine Art, Belfast. On the Road to Fontainebleau (1884) Private Collection. On the Loing (1884) Private Collection. Return from Market (188487) Private Collection. The Tennis Party (1885) Aberdeen Art Gallery. The fourth Cubist after Picasso, Braque, and Juan Gris. Soldiers Playing at Cards (1917) Kroller-Muller State Museum, Otterlo. Three Women (Le Grand Dejeuner) (1921) MOMA, New York.. The Music Lesson (1877) Guildhall Art Gallery, London. Terrace of Restaurant Jacob in Nienstedten (1902) Kunsthalle, Hamburg. The Parrot Man (1902) Folkwang Museum, Essen. Bank Crash (1881) Tretyakov Gallery. Classical painter, portraitist, strong influence over Impressionists. Music at the Tuileries (1862) National Gallery, London. Dejeuner sur l'herbe (1863) Musee d'Orsay. Roadmenders in the Rue de Berne (1878) Private Collection. Leading member of the Heidelberg School of Australian Impressionism. Lost (1886) National Gallery of Victoria, Melbourne. The Pioneer (1904) National Gallery of Victoria. 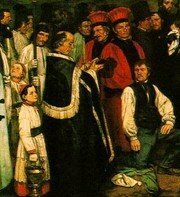 The Parish Priest's Wine (1869) Rheims Museum. Living Room with Menzel's Sister (1847) Bayerische Collection. The Zemstvo is Dining (1872) Tretyakov Gallery. The Wood Sawyers (1850) Victoria & Albert Museum, London. The Sower (1850) Museum of Fine Arts, Boston. The Angelus (1859) Musee d'Orsay. Man with a Hoe (1862) Getty Museum, Los Angeles. Women in the Garden (1866-7) Musee d'Orsay. La Grenouillere (1869) Metropolitan Museum, NY. Poppy Field (Argenteuil) (1873) Musee d'Orsay. The Cradle (1872-3) Musee d'Orsay, Paris. 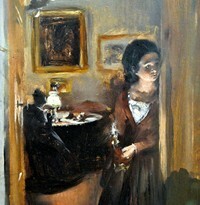 Woman at Her Toilette (1875) Art Institute of Chicago. Metropolitan School of Art, Dublin - a Lesson (1895) Private Collection. Breakfast in the Garden (1884) Pinacoteca Giuseppe de Nittis, Puglia. Irish plein air landscape and genre painter. One of the great Irish genre painters. Apple Gathering, Quimperle Brittany (1884) National Gallery of Ireland. A Scene in Phoenix Park (1895) National Gallery of Ireland. The Fishmarket (1895) Hugh Lane Gallery, Dublin. Russian genre and landscape painter. Easter Procession in the Country (1861) Tretyakov Gallery. The Drowned Girl (1867) Tretyakov Gallery. One of the most important Impressionist painters. Boulevard Montmartre paintings (1897-8) Various art museums. One of the pioneers of modern art. The Balcony (1868) Musee d'Orsay. The Unequal Marriage (1862) Tretyakov Gallery. Impressionist-style Irish portraitist and stained glass artist. Le Petit Dejeuner (1881) National Gallery of Ireland. The Fall of the Cowboy (1895-6) Amon Carter Museum, Fort Worth. Dance at the Moulin de la Galette (1876) Musee d'Orsay, Paris. The Swing (La Balancoire) (1876) Musee d'Orsay. Bargemen on the Volga (1870-73) Russian Museum, St.Petersburg. Religious Procession in Kursk Gubernia (1883) Tretyakov Gallery. They Did Not Expect Him (An Unexpected Visitor) (1888) Tretyakov. Shearing the Rams (1890) National Gallery of Victoria, Melbourne. A break away! (1891) Art Gallery of South Australia, Adelaide. A friend of Monet whom he visited at Giverny. La Vachere (c.1888) Smithsonian American Art Museum. American portraitist and genre painter. El Jaleo (1882) Isabella Stewart Gardner Museum, Boston. Repairing the Railway (1874) Tretyakov Gallery. Bathers at Asnieres (1884) National Gallery, London. Sunday Afternoon on the Island of La Grande Jatte (1884-6) AIC. Arguably the greatest Australian Impressionist. The Railway Station, Redfern (1893) Art Gallery of New South Wales, Sydney. The Reception (1884) Albright-Knox Art Gallery, Buffalo, NY. At the Cafe La Mie (1891) Museum of Fine Arts, Boston. At The Moulin Rouge (1892) Art Institute of Chicago. At The Salon Rue des Moulins (1894) Musee Toulouse-Lautrec, Albi. Founder of Intimism, a style of genre work. In a Room (1899) Hermitage, St Petersburg. In the Garden (1894-5) Pushkin Museum, Moscow. Woman Sewing Before a Garden (1895) Museum of Fine Arts Boston. The Blind Fiddler (1806) Tate Gallery, London. The Letter of Introduction (1813) National Gallery of Scotland. Distraining for Rent (1815) National Gallery of Scotland. Reading the Will (1820) Neue Pinakothek, Munich. For an explanation of 19th century or 20th century genre paintings, please see: Analysis of Modern Paintings (1800-2000). Critical realist Russian genre painter. Visiting (1915) Russian Museum, St Petersburg. Stag at Sharkey's (1909) Cleveland Museum of Art. The Lord is My Shepherd (1926) Whitney Museum of Art, New York. Cradling Wheat (1938) Saint Louis Art Museum, St Louis. Five Girls From Guaratingueta (1930) Museu de Arte de Sao Paulo. Jewish-Russian folk-painter, illustrator, stained glass artist. The Fiddler (1911) Kunstsammulung Nordrhein-West Falen. View from the Window, Vitebsk (1914) Tretyakov Gallery, Moscow. Canadian painter; exponent of Magic Realism. The Swimming Race (1959) National Gallery of Canada, Ottowa. Baptism in Kansas (1928) Whitney Museum of American Art. Snake Bay at Night (1959) Tasmanian Museum and Art Gallery. Progressive Russian artist also noted for her Neo-Primitivism. Moscow Street (1909) Private Collection. A Calabrian Worker's Sunday in Rome (1945) Pushkin Museum, Moscow. American urban realist painter; leading figure of the Ashcan School of Art. Snow in New York (1902) National Gallery, Washington DC. Chop Suey (1929) Museum of Fine Arts, Boston. Hotel Room (1931) Thyssen-Bornemisza Foundation, Lugano. Office at Night (1940) Walker Art Center, Minneapolis. Irish genre painter, member of the "Antwerp School". The Convent Gate, Dinan (1883) National Gallery of Ireland. Founder of Die Brucke artist group in Dresden. The Street (1908) Museum of Modern Art, New York. Berlin Street Scene (1913) Brucke Museum, Berlin. Bedroom at Arles (1992) Fitzhugh Farm, Robert/Jane Meyerhoff Collection. Manchester artist famous for his industrial townscapes and stick-like people. Coming from the Mill (1930) Salford Museum & Art Gallery, Salford. Park Restaurant (1912) Kunstmuseum, Basel. Zoological Garden I (1912) Lenbachhaus Gallery, Munich. Post-Impressionist leader of Fauvism, noted also for his later blue nudes. The Piano Lesson (1916) MOMA, New York. Woman with a Green Parasol on a Balcony (1919) Private Collection. Irish portrait genius, and genre painter. The Cafe Royal in London (1912) Musee d'Orsay, Paris. Left-wing Cubist artist; follower of Fernand Leger. Coffee (1935) Museo Nacional de Belas Artes, Rio de Janeiro. Poster artist noted for genre paintings of nostalgic American scenes. Freedom from Want (1943) Norman Rockwell Art Collection Trust. Thanksgiving. Mother and Son Peeling Potatoes (1945) Private Collection. The Seaside (1966) Arts Council Collection, Hayward Gallery, London. Mornington Crescent (1908) Private Collection. Ennui (1914) Tate Britain, London. Member of the Ashcan School, New York. McSorley's Bar (1912) Detroit Institute of Arts. French painter, member of Les Nabis. Interior (1903-4) Hermitage, St Petersburg. One of the greatest Irish genre painters. Off the Donegal Coast (1922) Crawford Municipal Art Gallery, Cork. The Liffey Swim (1923) National Gallery of Ireland. The Whistle of a Jacket (1946) Private Collection. Swedish portraitist and genre artist. Girls From Dalarna Having a Bath (1908) National Museum, Stockholm.  For more about figurative realism, see: Homepage.